Litecoin price extended its decline below $78 against the US Dollar. 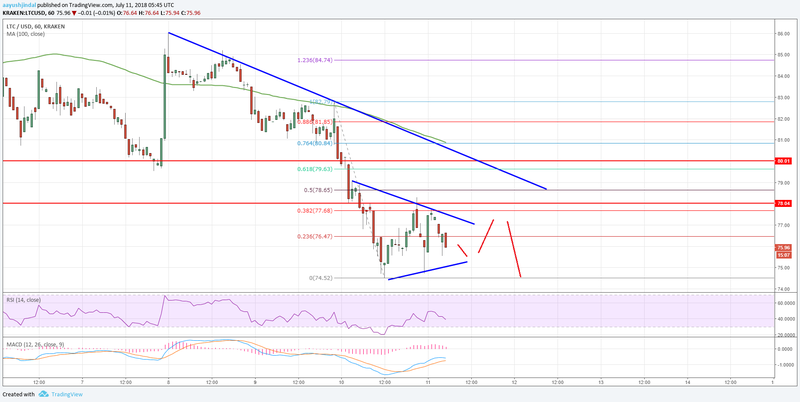 LTC/USD is now at a risk of more losses below the $75 support. Litecoin price was under a lot of pressure below the $80.00 support (Data feed of Kraken) against the US Dollar. There is a new important bearish trend line forming with resistance at $79.20 on the hourly chart of the LTC/USD pair. The pair is currently in a bearish zone and it could break the $75.00 support to decline further. Yesterday, we saw a fresh downside move in litecoin price below the $80.00 support against the US dollar. The LTC/USD pair declined further, broke the $78.00 support, and it tested the $75.00 support zone. Looking at the chart, the price fell sharply below the $80.00 and $78.00 support levels. There was even a spike below the $75.00 support and a low was formed at $74.52. Later, there was an upside correction above $76.00. However, the upside move was capped by the $78.00 resistance. Moreover, the 38.2% Fib retracement level of the last decline from the $82.79 high to $74.52 low also acted as a resistance. To the topside, there is a new important bearish trend line forming with resistance at $79.20 on the hourly chart of the LTC/USD pair. The same trend line is close to the 50% Fib retracement level of the last decline from the $82.79 high to $74.52 low also acted as a resistance. Furthermore, the previous support at $80.00 may well act as a barrier for buyers. Therefore, if litecoin price corrects above $78.00, it is likely to face a strong selling interest around $79.50-80.00. At the moment, there is a short-term breakout pattern forming with support at $75.00. Should there be a downside break below $75.00, the price is likely to accelerate declines towards the next support near the $72.00 level. The overall price action suggests more losses in LTC/USD as long as the pair is below $80.00.